Beet Chocolate Mint Brownies offer the perfect blend of minty goodness, sweet beets, and dark chocolate along with a delightful "cake-like" texture. Cheers to veggie desserts! 'Tis the season of joyful gatherings, holiday cheer, and signature flavors like cinnamon, gingerbread, and mint. These distinct seasonal flavors remind me of past holidays spent baking with family. I smile remembering my grandma Grace waltzing her way through the kitchen, and all of us uproariously laughing at gingerbread cookies missing limbs and sugar cookie cutouts appearing as unidentifiable blobs. Like many of you, holidays evoke beautiful memories, and it is not surprising that now as I am older, I still enjoy baking and cooking through the holiday season. To be candid, I am a sucker for baked goods. While trying to keep my sugar fiend sweet-tooth in check, I love inventing healthier versions of the decadent gooey goodness that my taste-buds crave. 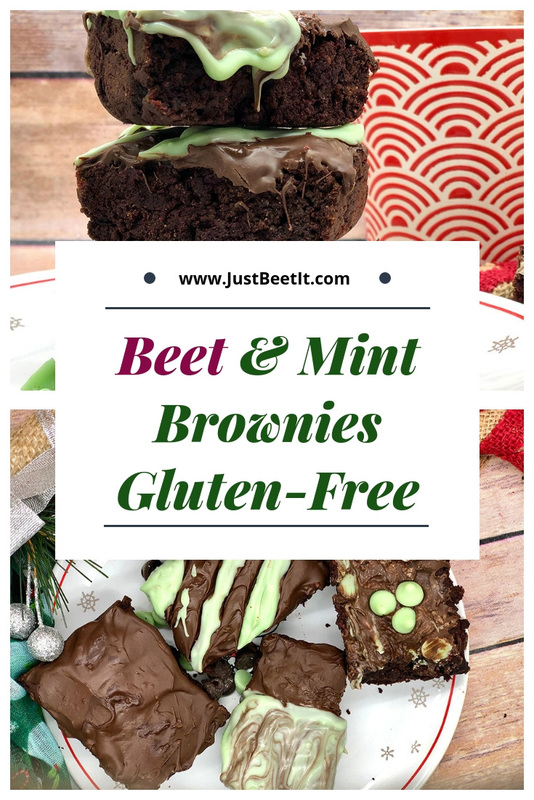 Beet Chocolate Mint Brownies provide a "healthier" dessert option during the holidays and also sneak vegetables into desserts for reluctant veggie eaters. Plus - these brownies are low in processed sugars and filled with vitamins, minerals, and antioxidants (Thanks to the nutritious beetroot and raw cacao powder!). If you want the healthiest option, eliminate the chocolate and mint melted chocolate topping. That contains the most sugar. These brownies are best enjoyed fresh out of the oven or within a day or two. Gluten-free all purpose flour is quite dense, and the brownies may become dry after a few days. When they are fresh and warm, these brownies are divine. Top these brownies with your favorite ice cream or vegan ice cream for extra flair. Wishing you a holiday season filled with joy, love, abundance, light, and gratitude! *If pressed for time, use packaged ready-to-eat organic beets. **As beets bring natural sweetness to desserts, this recipe doesn’t require unnecessary extra sugar, often found in brownies. If you want a traditional sugary flavor of brownies, add more sweetener to your preference. ***Dark chocolate mint chips are the most unhealthy ingredient, so include as you wish. Also, depending on the brand, some chocolate mint chips contain wheat and/or gluten, so for those with gluten allergies, choose gluten-free approved chocolate mint chips or avoid including in this recipe. All other recipe ingredients are gluten-free. 1. Preheat oven to 350°F. Coat 9-inch square baking dish with cooking spray or coat lightly with coconut oil. 2. Purée cooked beets in food processor until smooth, scraping down sides as necessary. Set aside. 3. In large bowl, mix together dry ingredients. Then, add in wet ingredients: vanilla extract, peppermint extract, coconut oil, and eggs. Mix well. Stir in pureed beets. 4. Add a handful of dark chocolate mint chips into the batter (optional). Gently fold into mix. Pour batter into prepared pan. Sprinkle dark chocolate mint chips on top before baking. 5. Bake for 15-19 minutes, or until toothpick inserted into center comes out almost clean. 6. Serve warm and gooey. 7. (Optional) Melt dark chocolate mint chips in sauce pan over low hit, stirring continuously to avoid burning. Once melted, spread chocolate on brownies as a “frosting.” Dark chocolate mint chips are not “baking” chips, but they will melt and make a delicious frosting for mint brownies during the holidays. Enjoy!